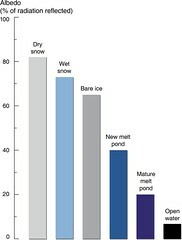 The albedo for different surface conditions on the sea ice range widely, from roughly 85 per cent of radiation reflected for snow-covered ice to 7 per cent for open water. These two surfaces cover the range from the largest to the smallest albedo on earth. Melting snow, bare ice and ponded ice lie within this range. There is a general decrease in the albedo of the ice cover during the melt season as the snow-covered ice is replaced by a mix of melting snow, bare ice, and ponded ice. As the melt season progresses, the bare ice albedo remains fairly stable, but the pond albedo decreases. During summer the ice cover retreats, exposing more of the ocean, and the albedo of the remaining ice decreases as the snow cover melts and melt ponds form and evolve. These processes combine to form the ice–albedo feedback mechanism.